That Thorn Guy will celebrate its second birthday next Wednesday, 25th January 2017! Gosh, this went fast! I can’t believe I’ve been running this site for two years now, but here it is. If you follow my posts you know that I’ve been experimenting with all sorts of Mark Lawrence related things, news, interviews, various competitions, etc, often not knowing whether all the time and energy I put into them would eventually pay off and they would attract much interest or gain any appreciation. Over 75,000 views during this two years in a way reassures me that it’s worth doing it and tells me that I must be doing something right, but I’d like to do it better if I can. For this reason this give-away is tied to receiving a little feedback from you. To take part and for a chance to win a signed (and/or dedicated) Advance Reading Copy of Red Sister (TWO on offer!) or a dedicated copy of the first edition (in both cases as soon as Mark receives them from the publisher) please answer at least two of the following questions in a comment under this post. Was there anything you liked on/about this site since it’s opened – either in general or a particular feature (such as a contest, an interview, finding all the Broken Empire maps, reader arts, etc.)? Was there anything you didn’t like on/about this site? What else you’d like to see here or see more of in the future? The give-away will be closing at 8am GMT on 26th January 2017 and there will be three randomly selected winners. 1. Your official Facebook page. 2. I originally stumbled upon the site when I was looking for your short stories. I stayed for the maps and blurbs. 3. Haven’t seen anything yet. 5. You’re awesome and I look forward to reading Red Sister! I enjoy seeing a lot of the material you post here, though of course, the contests are my favorite! Keep up the hard work! I can’t imagine how much time this takes, and it’s appreciated!! 1. I believe I followed a link to it from Mark’s Facebook. 2. I love the contests and the maps! 5. Thanks for the contest! 1. Heard about the site from a post on Mark’s FB page that someone linked to. 4. To be honest, I’m new to the site, but I like what I’m seeing so far! I love Mark’s work so more interviews, recommendations, reviews, news, contests, giveaways, and especially any original fiction from Mark would be welcome! 1. I believe I saw it on social media shared by Mark. 2. To be honest I am such a big Mark Lawrence fan that I like it all. The Giveaways/contest are particularly fun! 4. How about a place that fans can share photos of their Mark Lawrence book collections? and I would like to see my name mentioned more often somewhere? Ok then just the first suggestion then! 5. I can’t think of anything else, You do such a great job with this site! 1.Where did you hear about the site? (if you can still remember) – I Heard about from Mark’s FB page. 2. Was there anything you liked on/about this site since it’s opened? – The maps are great and I especially like the fan art section. 3. Was there anything you didn’t like on/about this site? – Nothing major comes to mind. Colour scheme maybe. 4. What else you’d like to see here or see more of in the future? – You’re doing so much already, I’m not sure what else there is to add. 5. Any other comments? – Keep up the great work! I found on Facebook and would love to see some BE fan fiction on there! I heard about this site by stalking you.. I mean following you on facebook. I like the short stories and the interviews that are found on this site. 2. Easily the writing contests, great fun and enjoyable to read the entries. 4. I think you do what you do very well and anything more I could ask for would be selfish. Perhaps maybe more contests? Hah! 5. BTS stuff? Maybe Mark can fill you in on old stuff we would never otherwise know. Did Prince of Thorns once have a different ending? That sort of thing …. 1: Reddit! /r/Fantasy loves Mr. Lawrence, and it’s how I discovered the Broken Empire series. 2. The “Graphic Novel” art. It’s neat to see other people put visuals to the story. Although I know my luck, I’ll try once more. 5) If Mark kills K….e, we riot. 4. Naked pictures of Mark . . . okay just kidding. Agnes told me about this site. I am so glad you did! I like the maps, short stories, insider info on my favorite author! I haven’t found anything I dislike yet. I love the contests! 1. Through one of Mark’s posts on facebook or twitter most likely. 2. I like all of it. I remember I really liked the style and overall feel when I first browsed through. It reminded me very much about TBE trilogy. I’m a cartography nerd and I often look at the art section, but I mostly come here for giveaways and news. 4. A bit more mobile support perhaps. The dream would be a full fledged, wiki on everything Broken empire world related. Though I guess with the new setting red sister is bringing that may be difficult. 5. Thanks for putting your time into all of this, and I mean every aspect of the site. Imo it’s the communities that carry the fantasy genre, and this site is a prime example of that. 2. I have really liked the writing contests (haven’t won yet… but every time is worth a shot!) and the really insightful articles that get shared to Facebook. Those are awesome and cool, and I really like learning from a professional! 4. More of the same! I am a huge fan of behind-the-scenes stuff that pertain to books I enjoy (like the trilogies! ), like “How does one develop technology in a fantasy setting?” or “Which came first, the magical or the post-apocalyptic?” And the little nuggets of writerly wisdom gained from experience. It’s fantastic! 1) I caught a retweet by Mark Lawrence and decided to check out the site. 2) I really like the artwork section. The contests are rather awesome, too! 3) Nothing I don’t like. 4) The more information on forthcoming works, the better! 5) Nothing but keep up the great work! 1. I heard about it from Mark on Facebook 2. Artwork and winning stuff, I like the silly competitions 3. Can’t say anything bad about it 4. More info on the Broken Empire if possible, and some insights into future works 5. Keep up the great work. 2. I really like the broken empire map that is on the website, it made me like it even more. Also the short stories and how well they are listed. 3. There’s nothing I dislike about the website, I check it about 3-4 times a week. 5. I can’t wait for Red Sister. I learned about this site from Mark. I’d like to visit more often! 3. I just can’t draw nor write anything so I can’t really take part in your competitions, but that’s my fault, so nothing bad about the site. It’s great to see other peoples work. 4. Maybe i just missed it…. But i really like to see a short story about the way Gorgoth and the others lived before Jorg came. 2. I like the maps! I’m a map person. 3. Nothing I didn’t like. 4. I’d like to see…more of anything and everything, really. 5. Love your writing & can’t wait for Red Sister! Like any unhealthly fan, I dedicated my time to a daily dose of stalking your facebook and twitter, which eventually lead me to this beauty of a site. I love the updates and art work on the site, and I am super intrigued about the comic book art work. In fact it has inspired some of my art. I also enjoy the interviews. Some of the links don’t always work, so they should be updated but that’s really all I have to say about the site. I would like more updates, buy that is me as a fan being selfish. The Broken Empire series is my favorite go to series for reading. 1. I think I saw a tweet from your site. I know I found it before I ever found Mark’s site! 2. I have really enjoyed the fan art that you have showcased. 3. Can’t think of anything I don’t like. 4. More art would always be nice! 5. Keep up the good work! Very nice blog! 3. I don’t know, first time here! 4. I like to collect desktop resolution art. Welcome content! 5. love love love prince of fools! have read it three times now. still awesome each time. looking forward to red sister so much!!! 2. The list of all the interviews is great. I think I have never actually seen this for any other author and it’s a lot more user friendly then the normal procedure of googling/going to the authors page/blog searching there/still not finding everything. In addition there is the birthday interview which I found quite interesting and unique. Also I didn’t know Mark Lawrence had written any poems. I probably won’t ever take part in any of the competitions, but I still think they are awesome. 5. Overall great page and thanks for the giveaway. 5. I really love your involvement within the community. Thank you for being so active. 1. Mark posted about it. 1. Either from your Face Book or possibly from a random lucky google search. 2. I like the Art, your musing and reflections, the contests, and possibly the most important are the maps. 3. Not currently but in a previous iteration of your webpage, I could’t find your contact info. 4. I really enjoying seeing fan art – so more of that if possible. Also, any writing or back ground details that don’t make it into the books, that while they may not needed for the main story, we as fans might enjoy. 5. I’m always curious about the books the authors I liked are reading and enjoying – Lists of your favorite books, lifetime favorites, yearly top list, worthy mentions, little know authors you enjoy, etc. Source: I’m here from the link in r/fantasy! Impressions: This is my first time on the website, but it certainly looks cool for all things Thornsy. 1) I heard about this site shortly after friending Mark on Facebook. I was drawn in with promises of excellent art. I was not disappointed. 2) Of course, any juicy bit of content is great, though contests always sweeten the deal. That being said, I always like to know how an author’s mind ticks, and so I love reading interviews. I have yet to fully crack Mark’s, but perhaps that’s a good thing. 5. Thanks for the opportunity! 1. I was scrolling through good reads looking for my next book that I might be interested in when I came across Marks profile and I was curious at what else the author had been doing and that’s how I came upon the website. 2. I loved all the fan art on the website that correlated to the books. It was interesting to see how other people saw these characters that I have come to love. 5. Thank you so much for sharing your books. They are currently sitting on my top row of my bookcase along with my other favourites that I reread whenever I have the spare time. I hope to see more of your work in the future. 1.I believe it was Twitter but it may have been the GDAF Facebook group. 2. I like the reader artwork and contests sections. 5. Thanks for the opportunity! 1) From Mark Lawrence’s twitter account. 2) New infomation on the books, especially the blurbs on red sister. 3) I think it loaded a bit slowly on mobile, but I haven’t used the mobile site in a while. 5) Good Job running the site, I work in IT it can be hard work yet rewarding to do this kind of stuff :). Saw a recommendation at Mark’s Facebook today, so visited this page for the first time. Therefore I can not comment on the other questions (yet), sorry. 1: I heard about the sight via Mark’s Facebook, though Twitter might have been a close second. 2: I particularly like the way this site feels a part of a genuine community… that Mark himself is part of that community, along with a whole lot of other great people… and that despite the world occasionally being grim and dark, there are still places to go to enjoy, share, and even revel in it! Thank you for opportunity to participate! 1. /r/Fantasy, the place where you go to find like-minded readers and say: “I am among my people”. I love the series and any related content to it interests me. 2. Well, I like the name, I have a soft spot for punny blog name, because it hints that someone writing it has sense of humour. But short stories and fanart are my favourite. 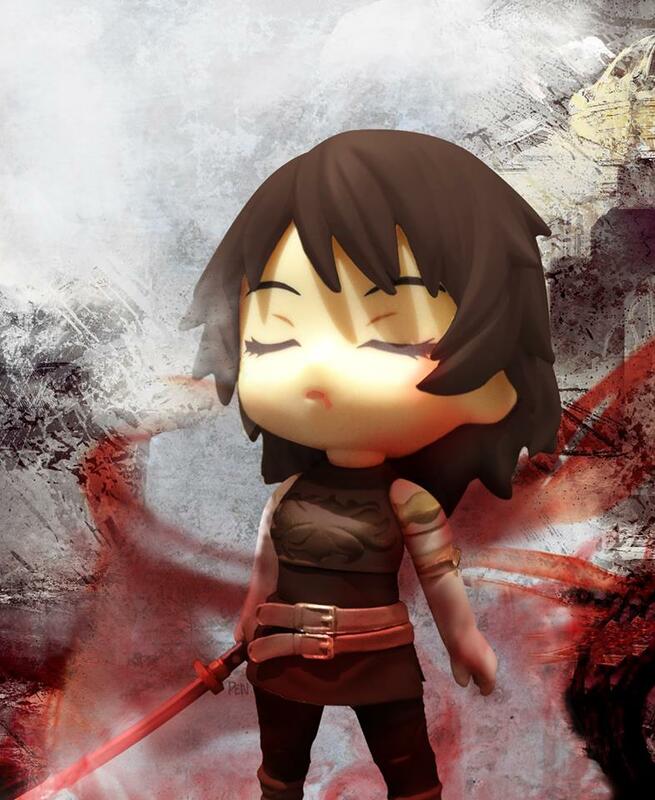 Just look at this nendoroid cover of Red Sister! So cute. 5. You’ve done an amazing job so far, keep up the good work! 1. From my husband who is a big fan. 2. I really really love the art section. It’s amazing to see the creativity of fans bringing to life the incredible work of Mark Lawrence. Thank you so much for hosting such an interesting website and for this giveaway! I’m so excited. 2. I like your blog posts, they are consistently interesting and I like hearing your opinion on things. 5. I love your books, Jalan is one of my favourite characters ever. 1. I heard about the site through the other blog! 2. I specifically like the maps and the art. While I am not much of an artist myself (as told by basically everyone), I do enjoy a good piece of work now and then. 3. While the colour scheme makes sense, it is a bit too bland for me. 4. More art contests/show-off blogs. I am also thinking about an RPG campaign set in the universe where Mark is the DM (through roll20 or something) and a few fans are selected to go through his campaign! After each session have a YouTube video or blog-post detailing what happened. 1. Google results when I was looking for a map of the Broken Empire. 2. The fact that you have fan art and maps. It’s hard to find cool pictures that aren’t the book cover. 4. I’m hoping they make this a Netflix series, in which case I’d love to see episode reviews. Where did you hear about the site? One of Mark’s posts on Facebook, I think. 1. Originally from a re-tweet from Mark. 2. I like that you seem to work with Mark, making your site the ‘go to’ place for reliable info on, and around, his books and writing. The contests and give-aways are, of course, an excellent and appreciated addition. Also, I quite like the site design. 3. Nothing I can think of that I’d change. It’s usable, useful, clean, and readable. 4. Hmm. Tough. For me, pretty much everything I’d want covered is/has been covered. 1. I’m Fairly sure it was Mark twitter feed. 2. Definitely the maps, love the art the reviews and the contests are always interesting even if I didn’t always win or participate. 2.- The contest make this site special. Also the direct relationship with Mark, that’s a plus for sure. 3.- I would change the design, but as I’m not a designer nor I’m known for my good taste I wouldn’t use my advice at all. 4.- I don’t know, you are doing a great job. Regarding Mark’s works, a deal to publish them in spanish and a youtube channel with content similar to his blog posts and tweets. 5.- Keep up with the good job! I heard about the site directly from Mark and links from his Facebook page. Love all of the content – interviews and great contests for fans. Maybe some sneak peaks from Mark? Everything looks great – keep up the awesome work. 1. I already followed you on twitter when you started the site, after Mark retweeted you a few times. 5. This is the first time I’ve visited on mobile and it’s a good site for mobile. Clear and easy to read. 1. Heard about it from Mark on FB. 4. More of the same! I liked someone’s suggestion of fan shared photos and art! 1. I first learned of ThatThornGuy after I met *Agnes Meszaros via a Goodreads message concerning a review I had left for Prince of Fools and then I saw a post she left on Facebook linking to the site. 2. I enjoy the information concerning Mark’s work and the contests are entertaining, especially the ones which require some creativity. I don’t enter every one but I enjoy seeing what others enter. 4. I join the majority here. More contests. More book giveaways. Maybe some art work giveaways as well. Adding some merchandise related to Mark’s books to purchase would be great! 1. I heard about it from Mark Lawrence’s twitter feed! 2. The contests are really fun and the maps are cool. 3. Nope, think the site is great! I heard about the site on twitter, and follow it via there and Facebook. I like the contests though I don’t often enter them, the range of entries on the more creative ones is fab!! 1. Mark’s Facebook page, as well as googling when I first started Prince of Thorns, completely oblivious to Mark’s activity/this site. 2. Oooh, so many things. I am a contest sucker, even if I’ve never ever won anything, so there’s that. I love the interviews as well, and the maps/extras are an obvious reason for why this place rocks. 3. Well, if I am being nitpick-y, it could benefit from better graphic design. I don’t know how much is WordPress limited though. 4. More interviews please! And I wouldn’t mind this turning into a broader fantasy den, frequently involving other contemporary authors. Mark’s first though! 5. Keep doing this, it really means a lot to us fans. So: thank you. Here’s to nothing, I guess! Good luck to everyone involved. 2) Giveaways are always great, but your focus and the fact that you’re tapping the vein directly with Mark makes this the best place to go for Mark-related news! 3) The color scheme could maybe use a bit of a revamp, but otherwise it’s a great site! 4) …more giveaways? Additional esoterica regarding Mark’s settings would be nice as well. 5) Excellent site! Motivates me to finish my layout and get mine up and running too! I must have heard of the site through Mr. Lawrence on twitter. I particularly like the art and the contests. Maybe an interview entirely in verse? Or a song and/or dance video? It’s an awesome site. May I say, “Live long and prosper”? I heard about this site either from Mark Lawrence or r/Fantasy… I don’t recall which. Another comment: This is an awesome giveaway. I’m really excited to get my hands on this book sometime in the future. I heard about this site through the Reddit fantasy board, as well as other comments and message boards on social media — I believe in a conversation on Mark’s wall. 2. Was there anything you liked on/about this site since it’s opened – either in general or a particular feature (such as a contest, an interview, finding all the Broken Empire maps, reader arts, etc.)? I found the maps extremely useful, as sometimes the maps in my e-reader are difficult to discern, especially when I want to zoom in to read some of the smaller text. I also really enjoy the writing competitions, and appreciate you posting all sorts of contributions. It’s awesome to have a centralized hub where I can dip into some creative fanfic in a world that’s close to my heart. 3. Was there anything you didn’t like on/about this site? Perhaps the spacing aesthetic can be cleaned up a bit, but I really like the fact that the responsive design works great for viewing in mobile. 4. What else you’d like to see here or see more of in the future? More contests like this one 🙂 Perhaps some preview chapter postings, or maybe some book recommendations that people would enjoy if they liked Broken Empire and RQW. Keep up the good work. Getting an ARC would be a dream come true. I’m an aspiring blogger and reviewer, and although I don’t have enough posted to start directing traffic towards any live reviews, it is my goal to get to the point where publishers would send me ARCs for advance reviews of books I might enjoy. Congrats on getting to that point; I’m only just realizing how much effort is needed to get there. Where did you hear about the site? (if you can still remember): Pretty sure it was on Fantasy Faction’s Facebook group. More than likely, anyway. Agnes frequents the place, as does Mark. What else you’d like to see here or see more of in the future? Pictures of kittens vanquishing other kittens. Any other comments? Gimme gimme gimme… please < not too proud to beg. 1) I’m pretty sure I heard about this site in an /r/Fantasy discussion. 2) I really like the insights into Mr. Lawrence’s work and the interviews. 1) From Mark’s facebook and I remember like it was yesterday. Maybe because it was. 2) I really liked the maps. I found them intresting. With them i knew where i was traveling in my mind. 3-4) So far I’m ok with everything. 1. I saw it on Facebook, shared by Mark I think. 2. I love the fan art, Mark’s short stories and the maps. Maps are awesome! 3. Nothing at all, I like everything! 4. More fan art. Maybe a gallery of fan art sorted by the most voted/popular ones? I’m a big sucker for fan art! More art contests would be nice too. 1.No. I didn’t hear of this site! I saw the link by Mark Lawrence, on his own Facebook page. 2.Well, I searched very much for Broken Empire Maps, and I found it here. Also I like the new news about Mark’s book. 4.Fan arts definitely, and more contests? 1. I follow Mark on Facebook and he posted a link to the website at one point. I’ve been checking it out ever since. 2. I definitely like the maps. Whenever Jalan was traveling, I would log on and check on his progress. I also like the free short stories and am a big fan of the contests. Uhhh, aand the interviews. Soooo that’s pretty much all the content on the website. 3. No, it’s pretty cool. 1. Through Mark on Facebook. 2. I love the interviews section! 2) Your SPFBO, it has brought to my attention many gems that would have gone unnoticed. 2. Fan art is pretty sweet. 3. Everything is pretty awesome. 4. More fan art, and contests! I had just read Prince of Thorns and I was scouring the webs, fan-girl-ing out, trying to learn what there was to learn about this fantastic author. 1. It was either on Mark Lawrence Twitter or on his Blogspot. I was surfing new Information for Marks new Book. And I think he linked it to your Summary of what we know about Red Sister. 2. I alwayls liked to search more Information on the Books i read in the past. Be it on Wikias or Websites like this. So Interviews and the findings in the Broken Empire are the things that i enjoyed the most nad wish to see more in the Future. 3. I am not sure about this one. It is always hard to find pages like this for your fantasy books. So i am grateful for every bit of niche Information that i can get. I did not read all of what you have posted hear and therefore can´t judge. 4.Well I would like to more of Fanarts and the finfing to Mark lawrence upcomng Books. I really like to explore the Worlds of my fav. Books. Keep going and Someone should update the Broken Empire Wikia. Hopefully the Red Queens War will come to Germany. 1. I heard about the site on Goodreads, maybe a year ago. Sometime close to the release of the Wheel of Osheim anyway. 2. I liked the writing contest you had, where you had to include the words “life” and “death.” I wrote an essay called The Void, I think. It wasn’t particularly good, if I’m being honest, but I had fun writing it. I actually just revisited the site hoping to find another contest, or see if you would be visiting Boston anytime soon. I would say I first heard about the site either on Mark Lawrence’s Facebook or his blog I honestly can’t remember which. In general something I like are the giveaways and interviews. Something I’d like to see more of… me winning contests. 1. I first heard about your site from Mark Lawrence, he posted a link to one of your contests on facebook. 3. Don´t think so… at least nothing I can think of right now. 4. I, of course, love your contests. But also your short stories and interviews, more of that would be nice. 5. Haven’t even had the time to read The Wheel of Osheim (it’s sitting on my shelves laughing at me…) and I’m already sooo anxious to read Red Sister!! 2 – Well, i love the contests (who doesn’t? ) and enjoy the interviews of Mark. Also, i like the artworks and have read the short stories. 4 – Definitely more contests, because i love them, and more interviews. 4 – More interviews and contests! 5 – Thanks for putting this together! 1. I first came across this site through r/fantasy on Reddit back when the Broken Empire Special Editions were first announced. 2. My favourite part about the site is probably that it exists at all. The Broken Empire was the first series that got me hooked on a particular author and it’s great to have a place for all things Mark Lawrence other than his blog. 3. The site could use a visual touch up. It’s a bit plain. 4. Keep doin’ what yer doin’. I have loved following all the different features on this site. And have even entered a couple of the contests. There is always something new to go and see or even re-look at bits I have not looked at for a while. It is great to see how it has developed over time. You do a great job Agnes. Everybody with internet access should at some time come and see/read/interact on here. It is great. Keep it up.